Class that helps perform 2-pronged boosted tagging using the "mass-drop" technique (with asymmetry cut) introduced by Jonathan Butterworth, Adam Davison, Mathieu Rubin and Gavin Salam in arXiv:0802.2470 in the context of a boosted Higgs search. undo the last step of the clustering step j -> j1 + j2 (label them such as j1 is the most massive). otherwise, redefine j to be equal to j1 and return to step 1. Note that in the original proposal, j1 and j2 are both required to be b-tagged and a filter (with Rfilt=min(0.3,Rbb/2) and n_filt=3) is also applied to j to obtain the final "Higgs candidate". See the example 12 - boosted Higgs tagging for details. one must be able to successively "uncluster" the original jet using "has_parents"
See also 12 - boosted Higgs tagging for a usage example. Definition at line 92 of file MassDropTagger.hh. 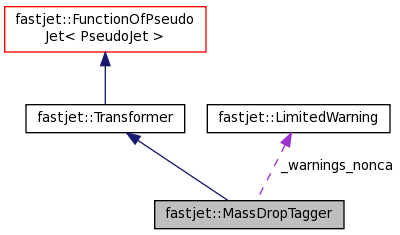 runs the tagger on the given jet and returns the tagged PseudoJet if successful, a PseudoJet==0 otherwise (standard access is through operator()). 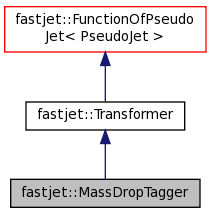 Definition at line 56 of file MassDropTagger.cc.